At Low Impact Development Consulting we will provide you with a timely building energy efficiency Building Code of Australia Section J (Part J) report. We undertake thorough Deemed to Satisfy (DTS) assessments including liaising with the building surveyor for more complex buildings that do not pass the simpler DTS assessment we can undertake energy modelling of the proposed building. This computer modelling JV3 performance / alternative solution generally provides more opportunities for solutions and meeting compliance than does the simpler DTS assessments. We will confirm DTS or computer modelling performance solution quotes within 24 hours, and turn most reports around within 1-2 weeks or to meet specific time-frames. We undertake JV3 performance based solution energy simulations on more complex buildings or where your building struggles to pass the deemed to satisfy Section J assessment process. A performance / alternative solution computer simulation is a more holistic and detailed assessment than the deemed to satisfy (DTS) approach. Where a standard DTS Section J assessment will fail the glazing component if one elevation fails, an Alternative Solution undertaken to JV3 requirements will allow for the net energy losses/gains of all the elevations combined. A fail in the glazing performance on one elevation can be offset by a greater pass on another elevation. Alternatively the energy loss/gains of the glazing can be offset by improved insulation in other aspects of the building fabric. 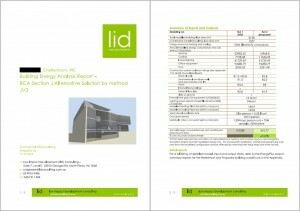 This more detailed modelling allows greater flexibility and chance of energy efficiency compliance for your building, than a Section J deemed to satisfy assessment might. It will often allow a lower specification glass tint to comply. Section J performance / alternative solution modelling is the non-residential modelling equivalent of the residential modelling NatHERS (FirstRate, Accurate, BERS) process, except that it generally involves a higher level of complexity than most residential modelling. Section J of the Building Code of Australia (BCA) requires minimum levels of energy efficiency to be achieved for non-residential buildings (generally building classes 3-10). Compliance applies to all new buildings within these classes, and to all new extensions or refurbishments of existing buildings in these classes, although there is some latitude as to how far compliance with Section J must go in some extension or refurbishment projects. 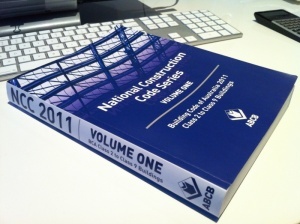 It is beneficial for BCA Section J compliance to be considered early in the design development stage of a project, ideally window schedules and walls types have been nominated, as it is then that the relevant elements: window locations, size and orientations, building fabric systems, lighting and mechanical heating, cooling and ventilation elements are being considered and can be altered if necessary. If obtaining Section J compliance is left until the end of the design process, un-welcome costs may need to be incurred to modify the design, or upgrade the spec of any of the above mentioned elements to compensate for weaknesses in the building fabric’s passive design characteristics. Alternatively a more expensive energy modelling JV3 alternative solution approach may be required to show the building still meets the required BCA building energy efficiency performance standards.